What kind of year will this year be for you? Will it be the same as or worse than last year? Or will you make breakthrough changes that will transform your life for the better? You can choose—and receive—the help you need! Do you consider change good or bad? But when the concept of change sinks deeper into our conscious and subconscious minds, it stirs up something else. Two-time heavyweight boxing champion George Foreman recognized that. He wrote, “Change of any kind scares most people so much … they don’t allow for something new to become a possibility before their anxiety talks them out of it” (George Foreman’s Guide to Life, 2002, p. 37). We all want things to change—for the better! But we’ve seen enough times when things went the other way. If change brings the risk of something worse or no better, most of us naturally cling to the status quo. We’re more comfortable with the problems we know than the unknown lurking behind the door of change. And not only that, change can be really difficult. We all have things in our lives that we wish were different and maybe even have tried to change, but we have given up and accepted them because permanent change is just so hard. If we are to change, we need to clearly see why we need to change—and the benefits. It’s ungrammatical, but it’s true: If it ain’t broke, don’t fix it. However, most of us find there are broken things in our lives. Things that aren’t really satisfying. Maybe some of our relationships are becoming more painful than pleasant. Perhaps we are stuck in patterns of self-destructive responses and habits that we can’t seem to figure out how to escape from. Perhaps you relate to author Charles S. Platkin’s description of his frustration with useless diets and a series of failed romantic and business relationships: “After years of research, self-reflection, self-examination, and my share of failures, I realized that many of the things occurring in my life were beginning to look familiar. I found something they had in common, that is, patterns and outcomes I had experienced before, which drove me to the same places that I didn’t want to see again” (Breaking the Pattern, 2002, pp. x-xi). Many of our natural reactions to disappointments don’t change anything. They are unfulfilling and just further the cycle of frustration and regret. One common reaction is to look for someone to blame. But this natural response is just another trap. As Mr. Platkin discovered after interviewing hundreds of successful people, “One of the key characteristics of all successful people is their ability to avoid the trap of blaming others for whatever failures or setbacks trip them up along the road to achievement. Blaming others means there’s nothing within your power or control to fix a problem. It means there are no choices. … No successful person would ever tolerate this kind of surrendering to the whims of others” (p. 13). Certainly other people add to our woes. But playing the blame game doesn’t help. It just sets us up for failure. The Eternal God created us with the capacity to change, and He will show us the way to transform our lives. If we choose to change, He will give us the help we need to break the chains of the past and prepare for a future beyond our wildest dreams! 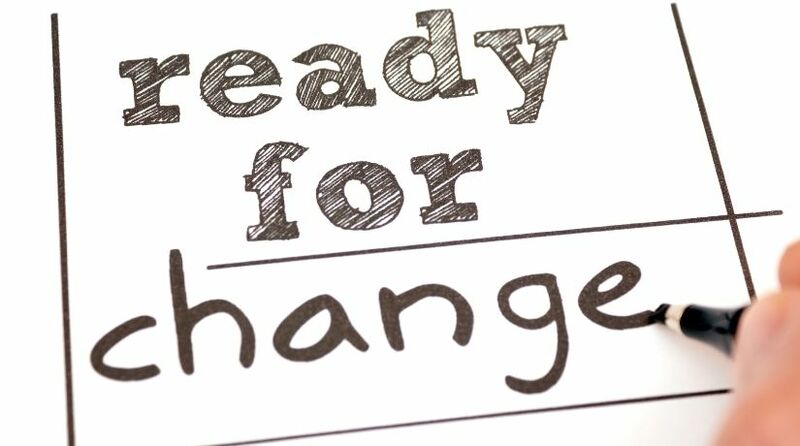 When we finally come to the point when we can no longer put up with the problems in our lives or their consequences, and when we recognize our personal responsibility, we are ready for change. At that stage, the situation may feel hopeless, but there is hope. There is Someone who wants us to change—and to succeed in life—even more than we want it ourselves. The Eternal God created us with the capacity to change, and He will show us the way to transform our lives. If we choose to change, He will give us the help we need to break the chains of the past and prepare for a future beyond our wildest dreams! What’s the No. 1 change God wants? God created everything, so He knows what works and what doesn’t. He made laws that show the right way to live, and He tells us that disobeying those laws leads to the heartaches and failures that afflict humanity. He tells us that all of us have sinned against Him and brought the automatic consequences upon ourselves—and earned the ultimate penalty of death (Romans 3:23; 6:23). But God is merciful and wants to forgive us—if we seek His forgiveness and commit to change. This change of mind—this U-turn in our lives—is called repentance. When we first come to recognize the need for this dramatic change, we may be fearful or feel overwhelmed. But it is more than worth it. It is the No. 1 change God is looking for in us, and it is the starting point for an awesome transformation. In the end, the great Creator God wants us to be His children! We begin making this change by learning about God’s beneficial laws (see our free booklet God’s 10 Commandments). Then we must recognize where we have broken those laws and learn to abhor those sins as God does. He hates sin intensely, yet He loves us so much that He allowed His Son, Jesus Christ, to pay our death penalty for us! That should impress on our minds both the enormity of sin and the awesomeness of God’s mercy. Repentance is not just expressing sorrow for past sins—it means committing to overcoming sin with God’s help and striving to live as Jesus Christ lived. The transformative gift of the Holy Spirit opens the way for even more beneficial results, including the wonderful fruit of the Spirit and eternal life as children of God! The benefits God offers those willing to change their lives are truly astounding! Of course, just reading these words will not change your life. Change requires action! What’s the next step? Our new booklet Change Your Life! presents a concise but more-detailed look at the biblical process of conversion. It examines the vital scriptures you need to understand to turn your life around and become the person God wants you to be. Download it now and commit to making the changes God wants from you this year and beyond. The information in the booklet is priceless—and the benefits will last forever! Many experts have tried to figure out the keys to success in life. Why do some people achieve so much, while so many of us just live day to day, struggling to keep our heads above water? The simplest, yet most practical and profound, list I have discovered was compiled by Herbert W. Armstrong, one of the most successful writers and religious figures of the 20th century. 1. Aim for the right goal. 4. Drive yourself—put out wholehearted effort. 7. Have regular contact with God and ask for His guidance and continuous help. These principles can be applied to any goal, but they are especially vital in the highest-priority spiritual goal. This most important goal can be stated in different ways in Scripture: to repent and be converted (Acts 3:19) or to be transformed to live like Jesus Christ (Romans 12:2; Galatians 2:20). By aiming for this goal of change, we will seek what He offers us—the wonderful Kingdom of God—and live as He lives—righteously (Matthew 6:33). There can be no greater success than achieving this goal—to be a child of God inheriting the eternal Kingdom of God (Romans 8:14-17)! Eat, drink, learn or try something new. Set an attainable athletic goal, like running a 5 or 10K (source: 43Things.com). Volunteer to help others (source: USA.gov). Of course, most resolutions are soon forgotten. A survey of more than 3,000 people by British psychologist Richard Wiseman found that 88 percent of all resolutions end in failure. This highlights the difficulty of changing habits and achieving goals, but it doesn’t mean setting goals is not important. Written goals with detailed, step-by-step plans and checkpoints are much more likely to be achieved. And remember, God wants you to succeed with positive changes to your life. So ask Him in prayer to give you an extra measure of strength to succeed! The 2007 movie The Bucket List cemented in the popular consciousness making lists of things to do before you die. Jack Nicholson and Morgan Freeman’s skydiving, drag racing and trips to exotic places are typical of many bucket lists, but some people’s life goals are more unusual. I want to longboard down an active volcano. I want to kayak in a bay of bioluminescent plankton. I want to do a handstand at the South Pole so I can say I held up the world. Many of the other goals in the book remind me of the excuse of hopeless people: “Let us eat and drink, for tomorrow we die!” (Isaiah 22:13; 1 Corinthians 15:32). But what would a biblical bucket list look like? “Let each of you look out not only for his own interests, but also for the interests of others” (Philippians 2:4). Do God’s will and support His work. “Jesus said to them, ‘My food is to do the will of Him who sent Me, and to finish His work’” (John 4:34). Give blessings to others (Genesis 27:4; 48:1-21; 49:1-33). “Seek first the kingdom of God and His righteousness” (Matthew 6:33). Abraham “waited for the city which has foundations, whose builder and maker is God” (Hebrews 11:10)—a goal he will soon achieve, thousands of years after he died! That’s what makes a biblical bucket list different. Like Abraham, God’s people know that what we do before we die is important—because it prepares us for a wonderful eternity when accomplishment will never stop! What’s on your eternity list?